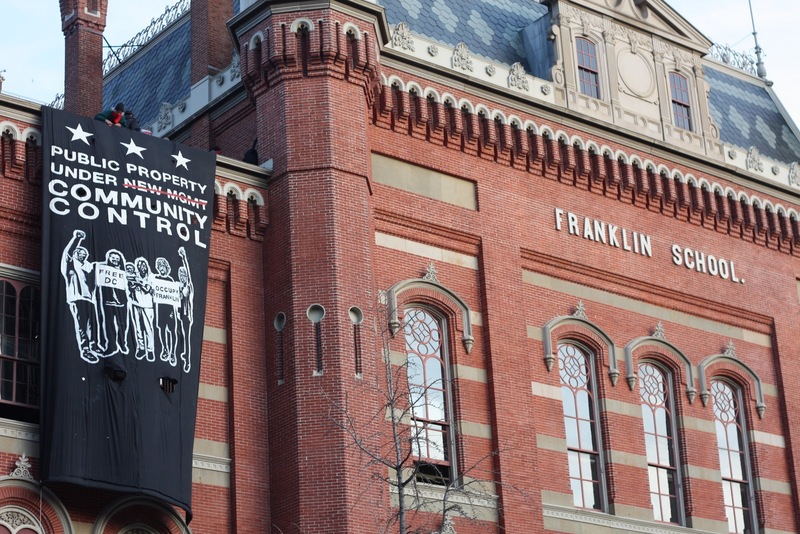 The Franklin School in downtown Washington, DC, has been sitting dormant for years now. A historic building situated right next to a park filled every night with homeless people that have nowhere else to go, the city-owned property could be put to a number of important uses that would benefit the community around it. But, alas, it sits empty. Until this past weekend. In a break from the sort of timid, SEIU-backed protests that the folks at Occupy DC have had an irksome habit of embracing as of late, a group of 11 activists without — oh no! — the endorsement of the McPherson Square general assembly decided to occupy the building and declare it under “community control.” Though they certainly couldn’t have had much expectation of being allowed to stay — they were removed within a matter of hours — as a symbolic gesture it was poignant. The building was being used as a homeless shelter until 2008, when the city closed it down just before winter. The plan was to sell it to a developer who would turn it into a boutique hotel. Homeless advocates, including Eric Sheptock, fought like hell to stop the closure. You can read his story here. It took about three hours for the police to pull the occupiers out of the building and haul them off. Until then, supporters did what they could to rally the crowd, document what was going down, and block the exits to make it a little more difficult for the police to get them out – at least not without witnesses. A passerby, who asked us to explain what was going on, agreed. He was “one of the lucky ones” who was able to get a home voucher before they cut the local rent supplement program. He commented that, in other cities, people said occupiers were violent, inferring that was not the case tonight. The move wasn’t without controversy. One middle-aged man walking a dachshund hysterically yelled at those of standing outside the building in solidarity with the occupiers that we had “just fucked” the Occupy movement by embracing “vigilantism.” At back at McPherson Square, dozens of people chose to hang out over joining their comrades two blocks away. Judging by the media coverage, however, the occupiers succeeded in drawing attention to the controvery surrounding the closing of Franklin School and the broader issue of governments privatizing community space for corporate gain — certainly more attention than any number of confined-to-the-sidewalk exercises in protesting self-gratification could have ever hoped to achieve. Wish meeting up with you had worked out when I was hanging out with BroadSnark last week. Good coverage of Occupy DC, Charles.